Western harbour, Malmö, with Santiago Calatrava's Turning Torso to the right. 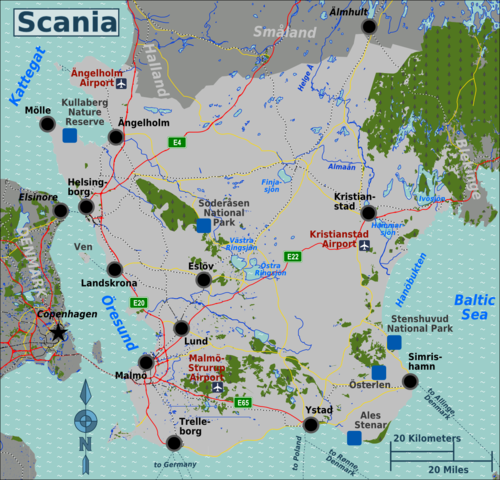 Scania (Swedish: Skåne, ) is the southernmost province in Sweden, and part of the Götaland region. It is known for its rich agricultural fields, its old history, long beaches, Danish heritage and a remarkable local accent. For much of Scania's history, it was part of Denmark, and retains many aspects of Danish culture to this day. The countryside is filled with ruins and graves dating back to the Bronze Age, when the society of this region was organized into various tribes. Later, Scania was home to the Vikings, great warriors who explored the lands of the Atlantic Ocean, conquered much of France, and traded as far as the Byzantine Empire. For some 500 years, Scania was the focal point of the struggle between Sweden and Denmark for control of the southern portion of what is now Sweden. Control of the region was crucial to both countries, as Denmark, by controlling both sides of the Oresund Strait, was able to control access to the Baltic Sea and charge hefty fees, which made up a major portion of its income until the 19th century. The Swedish crown resented the power of its neighbor and sought to control Scania itself. Although Sweden gained control of Scania in 1658, this was not the end of hostilities between the two countries. In 1660, the nations went to war once again, and as a result, Bornholm, which had become property of the Swedish crown, was returned to Denmark, establishing the present border between the two countries. Scania was placed under the control of a Governor-General, based in Malmo, and the process of fully integrating the new territory into the Kingdom of Sweden began. In 1666, as part of this process, the University of Lund was founded. Lund remains one of Sweden's most prestigious universities. In 1676, Sweden was once again at war with Denmark. The fighting devastated Scania, which was temporarily returned to Denmark. The Treaty of Lund, in 1679, returned Scania to Sweden. On May 9, 1719, Scania was finally fully integrated as a part of Sweden and split into two counties, Malmohus County and Kristianstad County. By 1863, the two counties had half a million people, and in 1970, the population reached the one-million mark. It was not until 1997 that Malmohus and Kristianstad Counties were amalgamated into a single, united Skane County, the administrative arrangement which remains to this day. 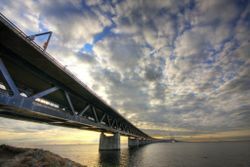 2000 marked a turning point in the region's history when the Oresund Bridge opened, connecting Malmo with Copenhagen, the capital of Denmark. After centuries of fighting, the two nations were united at last. With a few exceptions, including the Söderåsen ridge and the rolling hills of the northwest, Scania is generally flat, with a slightly sloping profile and a number of forests, including fir trees in the northeast and a belt of deciduous forests that bisects the county, stretching from the northwest to the southeast. Summer is the best time to visit Scania, with warm, mild weather. Even in the winter, snow has become relatively uncommon, and the region is the mildest in Sweden. Malmö is a large, young, and diverse city. Approximately half the population is under the age of 35, and the city has the highest proportion of Muslims in Scandinavia, as well as the highest proportion of individuals with migrant background in Sweden. Iraq, Denmark, and the former Yugoslavia are the largest sources of immigrant groups in Malmö. The university town of Lund also has a very youthful population, with much of the city's culture based around the University of Lund. Outside of the major cities, however, the population of Scania tends to be more homogenous. Many of the resort towns along the coast are popular travel destinations, and many Swedes, including some of the nation's wealthiest and most powerful individuals, have vacation cottages, known as stugor, in Scania. If you're a beginner Swedish speaker, beware that the local accent can be very hard to understand, particularly outside of the cities, sometimes even for native Swedish speakers. This accent, characterized by its numerous diphtongs, can be traced back to the ancient local dialect Scanian, which has largely been replaced by Standard Swedish with the accent, albeit with some Scanian words still in use. The good news is that English is spoken by nearly everyone, including most of the elderly. Øresundsbron bridge connecting Denmark and Skåne. Copenhagen Airport (Kastrup)  (IATA: CPH) in Denmark, is the main international airport of the area, located just across the Øresund bridge in Copenhagen. 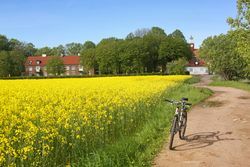 A 20 minute trip by train, bus or car takes you from Copenhagen Airport to Skåne. Skånetrafiken  trains run from Copenhagen Airport to Malmö and Skåne every 20 minutes, a one way ticket costs around 100 SEK (10 Euro). Malmö Airport (Sturup) , located 25 kilometres east of Malmö, has air traffic from Stockholm, Hungary, Poland amongst others. There are Flygbussarna airport coaches  connections to the cities of Malmö and Lund. Scania is connected to Germany, Denmark and Poland by car ferry. TT-Line runs services to Travemünde and Rostock (Germany) daily. Scandlines  and Stena Line  run daily services to Sassnitz and Rostock (Germany). 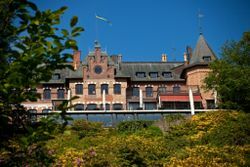 Scandlines  and HH-Ferries  run 24-hour services to Elsinore (Denmark). The trip takes about 20 minutes and the ships run at least every hour 24/7. Daytime there is a departure every 15 minutes. Unity Line  and Polferries  run daily services to Swinoujscie (Poland). National trains (SJ) from Stockholm and Gothenburg should be booked 30+ days in advance for best prices. Regional trains (Öresundståg) from the Danish east coast (Elsinore, Copenhagen and Kastrup airport) cross the Öresund bridge to Malmö and continue either up the Swedish west coast (via Lund, Landskrona, Helsingborg, Ängelholm, Halmstad) and terminating in Gothenburg, or to the east coast (via Lund, Hässleholm, Växjö) terminating in Kalmar. The E20 stretches from southern Denmark across the Öresund Bridge to Malmö, then follows the western coast of Sweden all the way to Gothenburg before crossing the country to Stockholm, connecting Sweden's three largest cities with Denmark's capital and making Scania easily reachable from almost anywhere in the country. The Öresund Bridge connects Scania to Denmark. Tickets to cross the bridge are open-dated, meaning that once purchased, they can be used on any date. You will need a ticket each time you cross; the tickets are the same regardless of which direction you go, and there is no return ticket - simply purchase two single tickets in order to cross. You can book your tickets online at Scania's official tourist website  or at the bridge when you cross. Skånetrafiken  provides comprehensive rail and bus service in the region. During Summer Skånetrafiken offer a special Summer travel card ("Sommarkortet") for limitless travel on all Skånetrafiken buses and trains in Scania (June 15-August 15th). The price for this card, 595 SEK (available at customer centres) has increased quite a bit over the last two Summers, but is still a good deal if you plan on traveling the region for a while. One card lets you bring one child under age 7, and two cards allow five people (maximum two over 20 years), so extra good value for families. WARNING! Cash is not accepted on Skånetrafiken buses and trains! Credit card can be used on regional buses and in ticket machines at train stations. For city buses you'll need a Jojo card  or use text message ticket (prepaid Swedish SIM cards are available from 50 SEK). Scania has a network of well-maintained, easy-to-use highways and roads and relatively clear signage, making a rental car a perfect option for getting around. The main road, the E20 (which coincides with the E6 for the entire portion in Scania) crosses the county along the west coast, from Malmö to the Bjäre peninsula. Another major highway, the E22, runs northeast-southwest, connecting Malmö with Kristianstad. Other highways include the E4, which branches off of the E20 in the northwest, and the E65, which connects Malmö with Ystad. Scania's rich history and culture make for wonderful sightseeing. Attractions include palaces, museums, botanical gardens, and other sights. Golf. From the centre of Skåne you can reach around 70 golf courses in 50 minutes. Choose from European Tour favourites and tranquil, friendly golf clubs. Barsebäck , host of the Solheim Cup 2003, is classed as the best golf course in Sweden. PGA of Sweden National Golf Resort  close to Malmö is considered one of the best golfing centres of northern Europe. Learn Kitesurfing in Lomma. Shallow sandy beaches, regular winds and comfortable water termeratures during summer makes most of Skåne a fantastic place to learn. There are a few schools in the area, the bigger ones are listed. In all of Sweden Scania is most known for the culinary arts. Malmö offers a wide selection of restaurants and Helsingborg is widely considered the culinary capital of Sweden, while the region of Österlen has alot to offer in the way of food. Scania's combination of the nutrient-rich Baltic boulder clay, the long hours of daylight, and the mild climate means good quality grain, good quality flour, and good quality bread. The region is known for its stone-baked rye bread, which is baked throughout the region (the bread is not baked using rye flour alone, as the result would be far too bitter - instead, wheat flour is added). Rye bread is used to make Scania's traditional apple cake. Other local cakes include dansbana, made from delicious pastry with raisins; Uppråka, made using potato and wheat flour; and spettkaka, a dry egg and sugar based dessert that is a must try for anyone visiting the region. While driving through Scania's countryside, you will likely see brilliant yellow fields of rapeseed, also known as canola. Canola oil is a very common ingredient in Scanian recipes. Other crops include apples, pears, Scania asparagus, and potatoes, all of which are frequently used in restaurants. However, crops are not the only produce of rural Scania. There are also many farms that raise animals for meat, as well as plentiful game, which is often served in restaurants. While Scania raises pigs and Sweden's only truly organic chickens, its most iconic livestock is easily the goose, as Scania's landscape is perfect for raising geese. Pheasants and partridges are widely hunted, along with roe deer and wild boar. And food isn't the only use for wild boar - they are excellent at rooting out chanterelles, a bright yellow mushroom that is popular in Scania. Finally, of course, there is food that comes from the sea. Since time immemorial, fish have been sought and hunted, not least the herring. Those who lived at the coast could eat fresh fish, but those living further inland had to find a way to treat them so that they would remain edible even after being transported. And so the fish were smoked, preserved in vinegar or simply salted. Smoked herring and spiced pickled herring remain popular dishes in Scania today. Other classic Scania fish include Baltic salmon and the eel. In recent years, Scania has become home to a dozen or so vineyards which make use of the local growing conditions to produce wine from grape varietals such as Rondo, Phoenix Orion and Regent. There are only limited opportunities for tasting these wines, and the producing vineyards have not yet achieved sufficient volumes for more widespread distribution. But these wines can be found in certain restaurants. Serious nightlife in Scania is found mainly in major cities like Malmö and Helsingborg and the university town of Lund. Sweden is one of the safest countries in the world, and Scania in particular is extremely safe. Crime is so rare in the rural areas that it is not uncommon for a food vendor to leave a money box sitting out by the street for customers to pay - and the idea that someone would take goods without paying, much less steal the money box, is practically unheard of. Still, basic common sense should be used, particularly in the larger cities, to avoid being the victim of a crime. This page was last edited on 20 April 2019, at 09:36.